It’s Time. Let’s Get ‘er Done! If you are considering adding a Room Addition to your existing home, then you are at the right place. Whether it is a one story Addition or a second floor Room Addition, American Housing Remodeling, Inc. has the experience, expertise and the professionalism it takes to guide you through every stage of your project from concept to completion. Once you decide you want to add that room, you will have three important decisions to make. First, you will have to decide what it is you want to do, second, you will have to decide how much you are going to spend, and third, you will have to decide on a contractor. The first part is actually the fun part and that is deciding on what kind of room addition you want to add to your home. Whether it be a bedroom, bathroom, family room or an entire second story, you should remember that you may eventually want to sell your home and that potential buyers will probably compare your home to new ones being built. Therefore, you may want to look at some of the design trends and amenities being included into some of the new homes being built today. Now comes the part that is not quite as much fun and that is trying to figure out how much money you will need for your project and where the money will come from. When figuring costs, you can use a square foot price of about $125 for first floor room additions and about $185 for second story room additions, but this is for estimating purposes only. It is not really practical to use a square foot price when figuring costs because there are always so many factors that have to be taken into considering that will affect the actual price, but it will at least give you a general idea. As for where the money will come from, only you can determine that. If you do not have enough cash, th en you will have to consider some type of loan and we can help you in deciding what type of loan is best for you. One more thing to consider when deciding on how much you want to spend for your project is your home’s value in relation to your neighborhood. The general rule of thumb is that any remodeling project that brings your home up to the level of your neighbors’ is a worthy investment. It doesn’t always pay to be the most expensive home on the block and many real estate experts recommend that a remodeling investment should not raise the value of your home to more than 10-15% above the median sales price in your neighborhood. Next, you will have to decide on a building contractor. Hmmm! Now this is where it gets tricky because there are two roads you can take here. You can take the high road, or that other road. 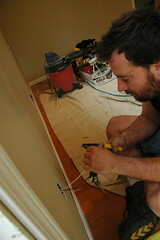 You will need to select a contractor that you feel confident will do your job right. At first you may be tempted to find that guy who works out of the back of his truck, or maybe that guy who may or may not have a valid builders license, or maybe that guy who may or may not have the proper insurances, or maybe that guy who is hurting so badly for work that he will be willing to do your job at a really, really “good” price. Of course, you know that a really, really, “good” price actually means a really, really, “cheap” price, and a really, really “cheap” p rice is the prescription for a “dream” home project to turn into a “nightmare” home project. This is your home and only you can decide which fork in the road to take here. So, when deciding on which contractor to use, you want to select someone you feel comfortable with, someone you can communicate with and someone you know you can work with throughout the entire project. You will want a quality contractor with a Florida State builder’s license, a contractor who is a member of the Better Business Bureau and a member of the National Association of the Remodeling Industry (NARI) and you will want a contractor who is fully licensed and insured. You will want to find a contractor who has a history of doing quality work at a fair price, a contractor with a proven track record and a contractor who will provide you with a ten year structural warranty. After all, this will be one of the most important decisions you will ever make regarding your home and American Housing Remodeling prides itself on being a “dream” maker, not a “nightmare” maker. We are the “Dream Catchers” of the Tampa Bay Remodeling industry and we will capture your “dream” of what you want your home to be and make it a reality. Once you have made the very wise decision to use American Housing Remodeling as your remodeling contractor, we will walk you through the entire process from beginning to end. We will explain the permitting process, how inspections work, how and when material will be delivered and how the work schedule will progress. All of these concerns, along with any other concerns you may have, will be addressed so you will know exactly what to expect throughout the entire project. More and more Tampa Bay area families are deciding to improve their existing home rather than move because they, like many people in today’s times, realize that they can have the home of their “dreams,” without having to move. It means you won’t have to give up your neighborhood, your neighbors, your friends or the schools your children attend. Everyone knows if your tooth hurts, you call a dentist. Everyone knows if you are sick, you call a doctor. But what do you do when your home needs help? Well, you call a home Professional; you call a Home Doctor; you call American Housing Remodeling. Paul Venuti, President and owner of American Housing Remodeling, Inc. is the one and only “House Doctor” of Pinellas County. Paul has been building one and two story room additions and remodeling homes for over thirty years and has spent the last fifteen years building them right here in Pinellas County. Paul has the experience and the professionalism to create for you the home you need, the home you want and the home of your dreams. Your home is your castle and it is something to take pride in owning. But as changes happen, even your castle needs to be modified to meet your ever-changing lifestyle. Now you probably won’t need to add a moat around your castle or even a draw bridge to cross your moat, but you may need to add more room on to your home, you may need to modernize your bathrooms or update the kitchen and American Housing Remodeling can write the prescription to get these things done without the pain that usually goes along with this type of endeavor! As time moves on, your life changes and so do your needs. Since moving in your home, you may have had a child or two, or you may now have a parent living with you, or maybe you just want to add an office or exercise room, to suit that ever-changing lifestyle. Whatever your reason for wanting to improve or add on to your existing home, American Housing Remodeling, with its long-standing history of performing quality work, and specializing in building one and two story Room Additions is a smart choice! Paul Venuti, along with his partners, Mick McKenzie, Lee Kretzer and Stuart Cohen, have been building New Homes and Room Additions in the Pinellas County area of Florida for well over thirty years. So, when you get to that point in your life when you just KNOW it’s time to act and make those changes to your home, please call the American Housing Home Doctor and give him a chance to show you how he can make that dream come true. Call 727-546-6611 for a FREE in-home consultation with either Paul Venuti or one of our American Housing consultants. The time is right and the time is now. Go ahead and make that call and we promise, it won’t hurt a bit! Homeownership is still the American Dream! American Housing is very involved in community projects and recently partnered up with the City of St. Petersburg, Florida and Habitat for Humanity of Pinellas County in order to build a new home and fulfill the dream of homeownership for a local family. American Housing Remodeling, Inc., through the City of St. Petersburg Neighborhood Stabilization Program, recently built this beautiful new home for Mr. Jones and his family. This achievement was celebrated at the home site on Tuesday, March 8, 2011 with members of the City of St. Petersburg City Council, members of the City’s NSP Program and members of Habitat for Humanity of Pinellas County. At the ceremony, there were gifts for Mr. Jones and his family. A Habitat volunteer provided Mr. Jones with a “symbolic” Habitat for Humanity hammer to take care of those small jobs around the house. City of St. Petersburg Council Members Wingay Newton and Bill Dudley gave the proud new owners an American flag and Kevin Klucas gave a “Welcome” mat. David Fornek offered Mr. Jones a new Bible for him and his family. Clarence Scott, City of St. Petersburg Council Member, then gave Mr. Jones the keys to his new home. A proud Mr. Jones then proceeded to thank the City and American Housing for helping him and his family achieve their dream of owning their own home. Finally, the Reverend Daryl Sey from the St. John Missionary Baptist Church blessed this new home for Mr. Jones and his family. For more information on the City of St. Petersburg NSP program, you can go to their website at http://www.stpete.org/nsp/program_information.asp or call us for more information at 727-546-6611. American Housing is located at 6580 72 Avenue North in Pinellas Park, Florida. YOU WILL KNOW WHEN IT IS TIME! A Room Addition is something most homeowners consider at one time or another. Whether it is because you have just learned you need a new room for a “nursery,” or maybe you have a parent, or parents, moving in with you, or maybe you want to reward yourself with that entertainment room you have always dreamed about. Whatever the reason, the time comes when you just feel you have outgrown your home and need more room. Like many of us, you may not want to move to a larger home because you either like your neighborhood, you like your friends, you have family that lives close by, you live on the water and love having access to boating, or you have an emotional attachment to your home. Whatever the reason is, and even though you know you need a larger home with more space, you just don’t want to move. Whether you want to add a bedroom, a bathroom, a family room or a master bedroom on to your existing home, you just know you need a larger home with more space. You may not be sure whether to add on to the back of your existing home or even add a second story. There are many things to consider in deciding on the best way to go here. You will want to look at design, you will want to look at aesthetics, you will want to consider traffic flow, and you will want to consider costs. You will need to consider what type of products and materials to use and you will want to consider the many different energy saving products and techniques that are available and which ones makes sense to use. There are many, many decisions to make and that is even before you get started. Well, this is where we, American Housing Remodeling, Inc. can come in and help you decide what might be best for you and your family. American Housing Remodeling, Inc. is your one stop Room Addition professional source and we specialize in one and two story room additions. We can help you at the conceptual stage in deciding what you want and how to accomplish it, we can help you in the actual design and drawing of the plans, and we can help you bring your dream of a larger, more functional home into reality. We will show you how to get it done and we can handle it from start to finish. Best of all, in most cases you can live in your home while the work is being done, even on two story additions. The owners of American Housing have been building New Homes, Refurbishing existing homes and building one and two story Room Additions in the Pinellas County and Tampa Bay area for over thirty years. We are members of the National Association of Home Builders, (NAHB), the Tampa Bay Builders Association, (TBBA), the National Association of the Remodeling Industry, (NARI), and the Better Business Bureau. You can contact American Housing Remodeling at 727-546-6611 or go to the “Contact Us” page and request more information. Here’s a neat little video describing current trends in Sunbelt kitchen remodeling, and how they got that way. West Metro Home Remodeling Fair – Kitchen Remodeling from St. Louis Park on Vimeo. A Great Time To Get A Home Improvement Loan. Interest rates are down and homebuilders are willing to make concessions. Remodelers are not working to capacity at all times and may be able to give you a better deal. Everything else being equal, this would appear to be a great time to get a new construction or remodeling construction loan. Currently there are a lot of competition for the refinancing of mortgages and buyers of new homes that meet the requirements of a loan. With mortgage interest rates well below the rate of primary interest, it is time for a mortgager writing of terms or of putting in place a mortgage on a new purchase. Each mortgage lender or broker can demonstrate substantial savings to be kept going in that direction. Building a custom home or remodeling in the Tampa Bay area? Don’t forget to design the laundry room. While the laundry room is often ignored in design, making your space more efficient and attractive can make your laundry experience a lot more pleasant. Typically, the laundry room is made to look overly institutional, completely lacking design. Add a little pleasure to the unexciting task of laundry by giving your laundry room a theme. Art objects while normally disregarded for the laundry room can help support your custom selected theme. When choosing a décor make sure it will help give your laundry design a clean style to it. Replacement windows for your home can be significant investment in both time and money. There are many manufacturers, window types and styles, and a wide price range from which to choose, and the decisions you must make can seem endless. Which manufacturer should you go with? Do you want aluminum windows or vinyl windows? Should you choose hurricane impact resistant windows or non-impact windows with hurricane shutters? What about double pane-thermal insulated or thermal insulated with hurricane impact resistant glass? How can you take advantage of the new Energy tax credit of up to ,500.00? Of course, as you make these choices you’re reminded that buying windows is like buying anything else: the more items we put in our ‘cart’, the higher the price. Choosing the right windows and a reputable company to install them for you can take a lot of time and homework, so here is some helpful information to get you well on your way. In Florida, some other considerations are whether to choose an aluminum frame window or vinyl. The majority of hurricane impact resistant windows are aluminum. It is stronger and therefore easier to build the window to the standards needed to obtain Miami-Dade product approval for the impact window rating. There are very nice vinyl impact windows on the market that do meet code requirements, however expect to pay a premium for them. The difference between aluminum frame and vinyl windows (besides the price) is that vinyl conducts far less heat than aluminum, making vinyl much more energy efficient. Florida Gulf Coastal Homes Are Different. Tt’s not the big things in life that get to you and your house, it’s all the little things. Most homes in the Pinellas, Manatee, and Hillsborough County areas will never be damaged by the “big weather” that occasionally blows through the Gulf Coast region of Florida. But all of our structures are vulnerable to the little guys: molds, fungi, and insects. When building or remodeling, these little things need to be planned for. The use of efficient and ‘locally appropriate’ climate controls systems are important for not only comfort, but for the ’war against mold’. To those ends, correctly designed mechanical systems keep moisture down and comfort up in our warm,moist climate. Higher ceilings are energy efficient in that cool air stays low. Fans are fairly common in Tampaarchitecture. Air movement makes a slightly higher thermostat setting very tolerable. Use of traditional skylights and ’solatube’ skylights can help reduce lighting costs and make the living spaces more pleasant. Passive solar techniques, when possible, can give a great ‘leg up’ on reducing home energy costs. Vanilla Ice: The Next Bob Vila? This Old Vanilla Ice House? Maybe! 80s rapper vanilla ice began the new show “The Vanilla Ice Project” on The DIY Network Thursday October 14th. Where? Wellington Florida — in a 7000 ft.² mansion. He paid $420,000 for the house and after adding $300,000 in home improvements he intends to put it on the market for a cool $1 million. Exactly what has Ice added to the home so far? A full home theater in the attic is just one of the new features and it not only boasts electric curtains but “mood sensing” lighting as well.